I arrived just before 8:00 a.m. at the Habitat for Humanity of Kanawha & Putnam County worksite for that day, tucked away down a dead end street of modest but charming little homes in Charleston, West Virginia. All in all, about 12 of us showed up, and we represented a variety of ages, origins, and abilities. 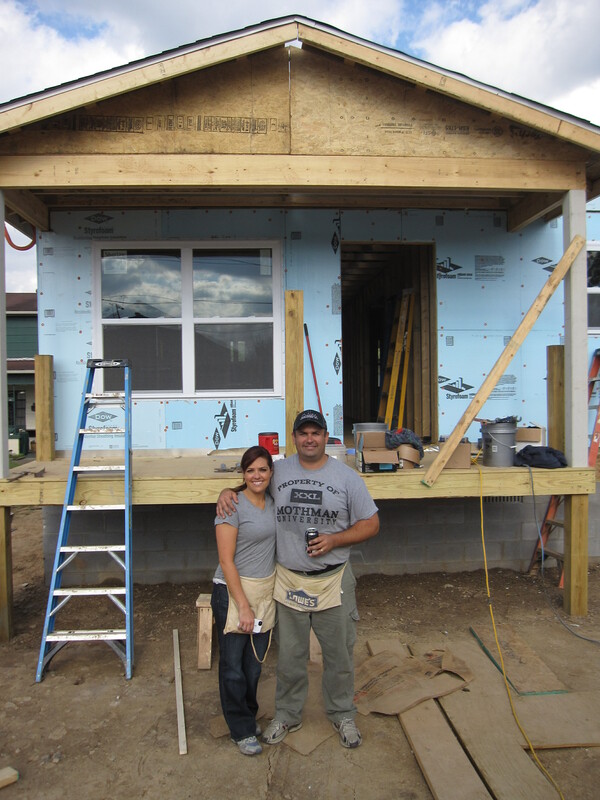 Habitat for Humanity encourages and accommodates people of all experience levels and physical abilities to participate. Building a house involves so many jobs, from highly skilled to unskilled, from strenuous to light work, that there is something for everyone to do. I haven’t built anything with my hands since I made treehouses as a kid. There are more tools and gadgets than I knew how to use or even what they were for. Construction terminology is highly specialized. Overwhelmed at first, I wasn’t sure what to do. Tiny (Bill Hanshaw), the construction supervisor, did a good job of putting us all to work at something we felt comfortable doing. I raised my hand to say I was comfortable on the roof, which needed shingling, but then thought better of it: being prone to bad sunburns, I didn’t want to spend the whole day exposed. With Krispy Kreme doughnuts for fuel, I ended up working mostly with John Powell, installing all the windows. They were prefabricated, so all we had to do was insert, level, and nail in. My hammering skills were rusty, but despite a few mangled nails here and there, proved adequate for the job. Both John and I hammered until our arms were sloppy tired, but my aim wasn’t too far off most of the time. I didn’t break any windows—my biggest fear! John and I ended up complementing each other well—he was more handy overall than I was, while I was happy to do the high ladder work. To my mind, going up and down the ladder on soft, uneven ground, bodies contorting to reach difficult places, was actually more dangerous than being on the roof. Often we needed both of us up high at the same time, and in the end John climbed almost as much as I did, with help of Jan Powell, his wife, on the ground to hold the ladders steady. After hanging the windows, we taped the seams around them and on all the outside walls of the house. I had a chance to chat over lunch with the local board president, Robert Groom. 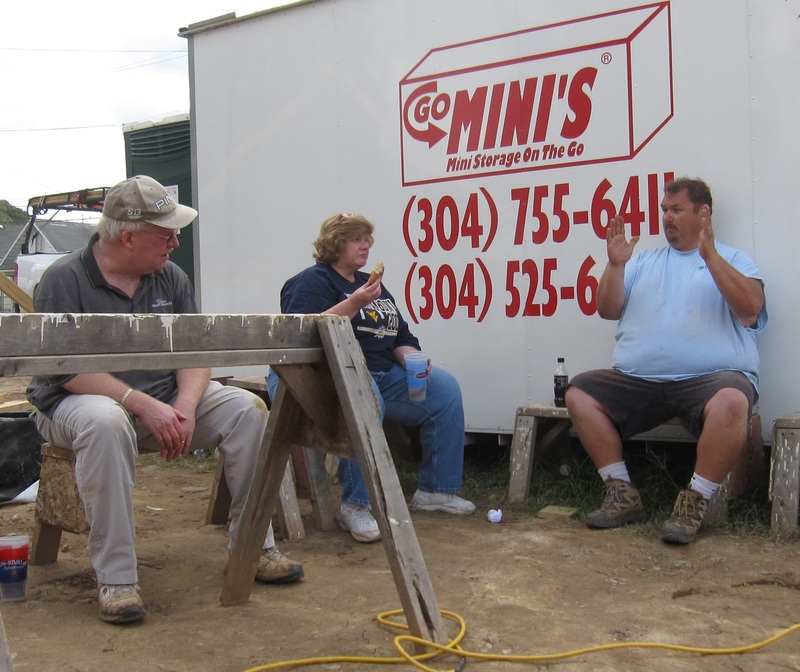 Habitat for Humanity of Kanawha & Putnam County is obviously a strong organization in West Virginia. They have a large number of volunteers (though more are always welcome), and this volunteer experience was the easiest to set up of all I had done so far, with a user-friendly automated signup process, plenty of helpful information, and no problem emailing or calling and talking to a live person with questions. I received a prompt survey right after volunteering to find out about my experience and ways they could improve. All in all, a well-oiled machine that had resulted in about 150 houses built in the area, the equivalent of a whole village or a small town. It felt really good to get dirty and even better to make real progress that we could see with our own eyes. The house was completely open to the elements when we arrived that morning, and after a good day’s work we left it with the windows and outside doorways all sealed up, the roof completely on. Beyond the great feeling of accomplishment, once again I found instant community with a group of warm, friendly, fun people committed to one cause. 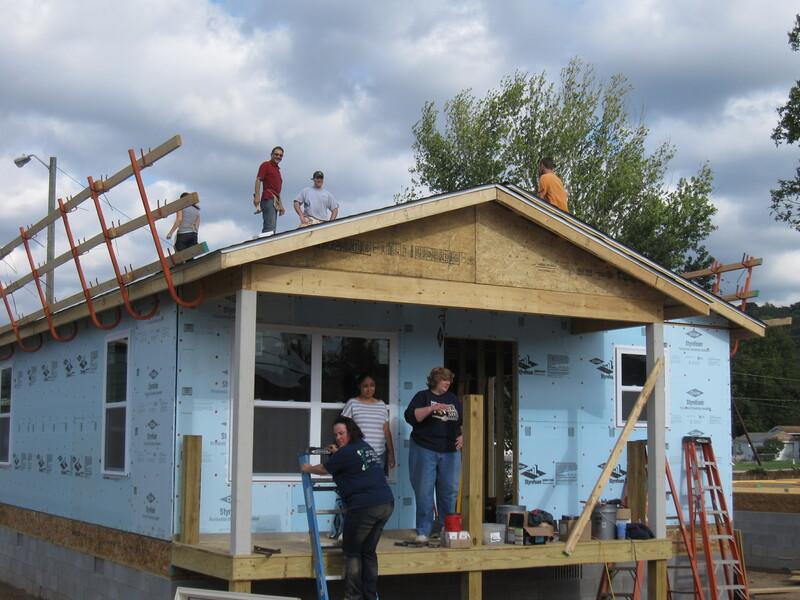 Maybe best of all for me, with Habitat for Humanity chapters all over the country, I can volunteer not only while traveling but right in my own community, and I intend to do so. West Virginia was my 49th state. Just one more, Nevada, to go (unless and until Puerto Rico becomes the 51st state). I’m saving Nevada for next year. In the meantime, I’m going to explore “random acts of volunteering” going on in other parts of the world, among other topics. Comments? Suggestions? Please make them here on my blog (and if you make comments on Facebook, please repeat here so that others not on Facebook can see). Nice! I’ve volunteered with Habitat once, here in Tacoma. It became the home of a family I worked with at the school where I was working at the time. Somehow, my volunteer hours went toward the hours that the family needed to put in themselves….What a great program and the outcome is so tangible.